With the way of making, everyone would devour this apple salad. And it’s healthy as I used yogurt cream. 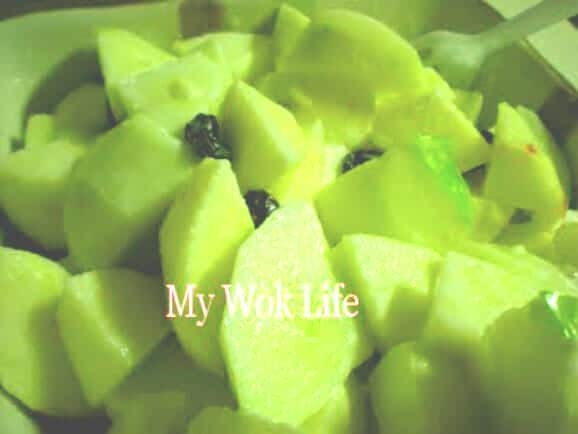 Delicious and healthy as snacks or before/ after-meal fruit dessert! I eat this as my lunch replacement, sometimes. 1) Peel and cut the apples into bite-sizes. Rinse with salted water. 2) Add orange juice (or 1 teaspoon of lemon juice to further delay apples from oxidation) and honey. Then, add yogurt and combine well. 3) Sprinkle raisin, and serve. A large portion of this apple yogurt salad counts about 100kcal. Healthy and low fat! Tips: If eat this after meal, make sure you have your fruits at least 30 minutes after meal.